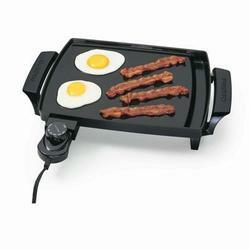 Look at this super, small scale electric griddle! A delightful, specialty cooking pan that works great as a pancake griddle, bacon griddle or griddle for eggs, french toast, and other favorite breakfast foods. Try this electric Presto Liddle Griddle Non-stick Mini-Griddle. It's a great size for cooking for one. Cast aluminum Is strong, durable, resists warping, and heats evenly. Non stick coating Provides stick-free cooking and easy clean up. Compact size Is convenient for storage. -- Ideal for serving one or two persons.